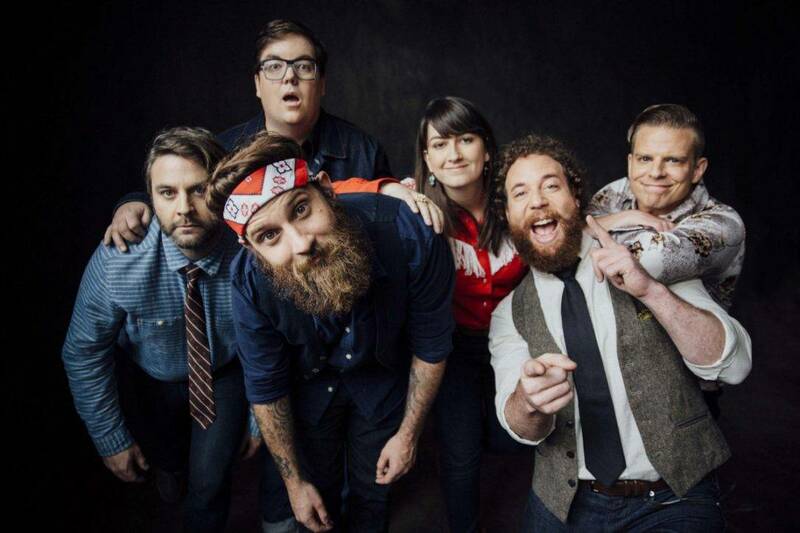 The Strumbellas are a band with a positive, upbeat attitude. It’s fitting that their latest album is called Hope. While some of their lyrics may sound despondent such as “It’s hard when you’re living and you don’t feel much,” overall their songs come across as cheery and hopeful, and so do they as a group. I enjoyed their onstage banter and camaraderie, and they were nothing but respectful when urging the crowd to sing along or participate. Their clear vocals and cheerful tone continued as they played “Young and Wild” off their latest album. Ritter was the most enthusiastic keyboardist I’ve ever seen, dancing and jumping so much I’m not sure how he managed to play so well at the same time. Lead singer Simon Ward told the crowd that they are very excited to be back in Canada for this next leg of their tour after being down south for a while touring with Cold War Kids and playing Austin City Limits. Izzy Ritchie’s violin solos were quite impressive, and it’s refreshing to see that instrument appear in an indie rock band. “We Don’t Know” was one song that featured her beautiful strings as Ward made conducting motions, and the rest of the band joined in to fill out the song in a perfect crescendo. Ward and Ritter love to mock and tease each other which made for some entertaining banter. For example, when Ward introduces his bandmates he purposely leaves Ritter out which got lots of boos from the crowd. It’s all in good fun though and you can tell that they have a brotherly relationship. There were plenty of opportunities to dance and sing along with the band; and they even orchestrated a male versus female screaming contest. They love to interact with the crowd. At one point they asked one audience member to guess the average age of the band, which turned out to be 34. “If you want us to prove it, we’ll take our shirts off,” said Ward. He did end up taking his shirt off before the night was through. Reminiscing about their days playing at The Railway Club and being paid $100 for one of their early Vancouver gigs, it’s clear The Strumbellas have come a long way. They seem to have remained humble, and I’m sure that with their positivity and gratitude, they have a long way to go yet. “Spirits,” of course, was saved for the end of their set, before the encore. This also featured an enthusiastic sing along before they came back for a two song encore: “Home Sweet Home” which has a down-home folksy feel and “Sailing” which sent us away with a calm, soothing melody. I’ve been a fan of The Strumbellas since hearing their music on the radio, and I was glad that their live show gave me even more reasons to continue listening.